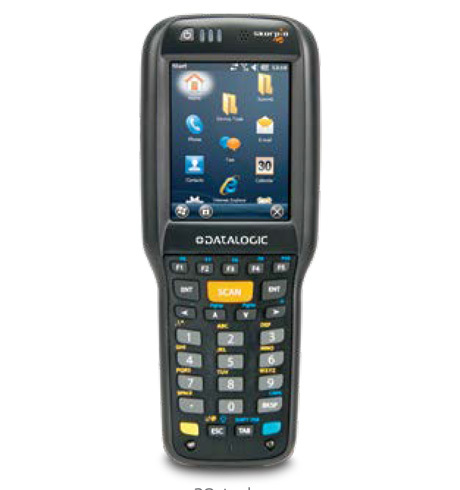 The mobile terminal Skorpio X3 from Datalogic is the successor to the successful Skorpio – fundamentally revised and with even more performance. Because of its wide range of capabilities you can use the Skorpio X3 in a variety of functions: in goods received, in warehouses and as sales support. It offers one of the largest color displays of its class; the touch display has a screen size of 8.1 cm (3.2”) and offers plenty of space for comfortable and well-arranged handling. Thanks to the LED backlighting it ensures for good readability at all times – independent of lighting conditions. The accompanying touch pen comes standard with delivery and can be pinned directly to the device, so you always have it handy. Profit from the fast XScale PXA310 microprocessor, 256 MB RAM and 512 MB flash during daily use. Optionally you can affordably expand the memory up to 32 GB with the help of an SDHC card. The operating system Windows Embedded Handheld 6.5 or Windows CE 6.0 is already pre-installed so that you can directly begin. Use the pre-licensed PAL software to easily tailor the data collection to your needs. The Skorpio X3 simplifies mobile communication. Integrated Bluetooth and 802.11 a/b/g Wi-Fi connectivity guarantee access to databanks (with the corresponding network) and allow for direct communication on the entire premises – in the sales room, in the warehouse, outdoors and in production. For the necessary security during data transfer processes rely on the RF safety records, such as WPA and WPA2. The Skorpio X3 is also CCX V4 certified, so you profit from all the advantages of a Cisco Wi-Fi infrastructure. USB and RS232 interfaces are also integrated, and an Ethernet connection is achieved via an external charging station. Whether you decide for the 1D laser scanner or the 2D imager, both are angularly crafted for ergonomic considerations. Both also enable users to scan the direct view on the display. For particularly scan-intensive applications simply order the optional pistol grip. It can be screwed on in a few simple movements and additionally simplifies handling. When it comes to simple handling the Skorpio X3 has even more to offer: like most Datalogic devices, the Skorpio X3 scanners are equipped with the patented Datalogic Green Spot technology, which confirms every successful scan with a highly visible green dot. To make scanning even easier the 2D device additionally offers a five-point targeting device. The five illuminated points guarantee precise and quick barcode capture. Even the housing properties of the Skorpio X3 are excellent: the lightweight housing with its compact form is one of the most robust in its class. It withstands falls from up to 1.5 meters without suffering any damage – even onto concrete. Its IP64 certification ensures for reliable protection against splash water and dust, so that even dusty warehouses and sudden rain showers during outdoor operation are no problem for it. For temperature fluctuations between -10 °C to +50 °C you do not have to worry, since the Skorpio X3 also reliably operates within this range. The battery of the Skorpio X3 is easily exchangeable and can be recharged via the external charger. Alternately, you can charge it directly on the device via the micro USB connection. For even more power and longer operation times order the optional high performance battery with 5,200 mAh. Also choose between three keyboard layouts: alphanumeric, numeric and function-oriented.